Enjoy a wonderful relaxing holiday in Villa Diana, a luxury 4 bedroom detached triplex villa with private pool and garden. The villa is built in a Greco-Roman style with feature pillars, arches and decorations. Villa Diana is situated in a quiet residential part of Calis, but still close to local amenities, such as the beach, dolmus route, shops and restaurants. The immediate surrounding area is semi-rural and is a mixture of newer holiday homes and established Turkish houses. You will therefore experience the sights, sounds (and maybe occasional aromas) of Turkish life. Please note that a new mosque has recently been built nearby. There is a mini-market about 5 minutes walk, just across the main Calis road. Here you can buy pretty much everything you need. The beach (at the Seril1 end) is an easy 10 minute flat walk. Enjoy the mountain views from the rear of the villa and the beautiful sunsets from the front roof terrace. Laze around the 30 sq metre pool on the cushioned sun loungers and enjoy a BBQ meal on the terraces. The villa has a private gated driveway. The garden and pool are maintained daily (except Sundays). If booking for 2 weeks, there is a mid holiday linen change. A welcome pack is provided. The swimmimg pool is available throughout the May to October season. NEW for 2008: A roof has been built over the front terrace providing welcome shade, and so that al-fresco meals can be better enjoyed. There is now a pool-side shower for guest use. NEW for 2010: A pergola has been constructed at the end of the pool, with vines trained overhead, to provide a relaxing shady area for eating or lounging. 2x adult bikes provided for guest use. NEW for 2011: Exterior security lighting installed. NEW for 2012: Complete interior re-painting. NEW for 2013: Complete exterior re-painting. Swimming pool completely re-tiled in blue mosaic, lighting upgraded to LED. Villa now connected to mains drainage. NEW for 2018: Brand new set of fluffy towels now provided for guest use around the pool or to take to the beach. NEW for 2019. Full Wi-Fi now installed. English TV (freeview) now available and streaming movies now available, all through an Amazon Firestick with Alexa voice control. All bedroom aircon units now replaced with latest technology 'inverter' type, all fully controllable, no silly timers. The ground floor is open plan and air conditioned. The front door opens to a spacious entrance hallway, decorative archways separate the lounge, dining area and fully equipped kitchen. French doors provide access to the front and rear terraces, where you can enjoy relaxing meals al-fresco. There is ground floor toilet/shower room - handy when using the pool. Take the curved marble staircase up to the first floor, where you will find a master bedroom (double bed) with en-suite shower room and french door to a small balcony overlooking the pool. Bedroom 2 also has a double bed and a french door to the small rear balcony with mountain views. Also on this floor there is a luxurious main bathroom, complete with Jacuzzi corner bath and shower. Continue up the marble staircase to the top floor, here you will find bedroom 3 (standard double size sofa-bed), complete with kitchenette and patio doors leading onto a private roof terrace with panoramic views (ideal for that all-over tan). This room can be either used as a bedroom, or for the smaller parties as a wondeful chill-out room to watch the sunsets. Also on this floor is bedroom 4 (twin-beds), please note that this room has a partially sloping ceiling and mountain views. The four bedrooms all have individually controlled air conditioning units - great when its really hot. The air conditioning units also have reverse cycle heating facility, this is useful for the cooler evenings, early and late season. The villa has been tastefully furnished and is fully equipped and ready to use. The maximum sleeping capacity is 8. This comprises of a maximum of 8 adults/children, plus an infant in a cot. NB Bedroom 2 is the only bedroom with space for a cot. The villa is an ideal base for exploring this beautiful area of Turkey. Fethiye is set in a pretty bay surrounded by pine-clad mountains and overlooking the 12 islands of the bay. It has a busy attractive harbour with excellent boat trips to be had day or night, plenty of good restaurants, and a weekly Tuesday market, to catch a bargain. 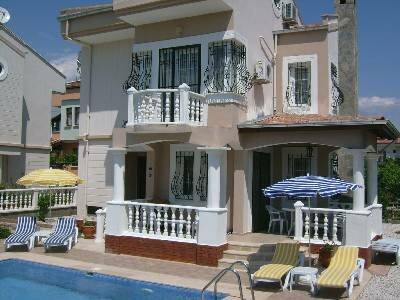 Nearby is Olu Deniz, the famous nature reserve and beach. If youre looking for lively nightlife, Hisaronu is within easy reach of Fethiye. NB The villa is situated is a mixed area of holiday and local houses, so you will/may hear noises from animals kept by locals, including cows, sheep, goats and chickens. Enjoy a relaxing week of luxury in this beautiful villa, within easy walking access to the Calis promenade, beach, shops, bars and restaurants.